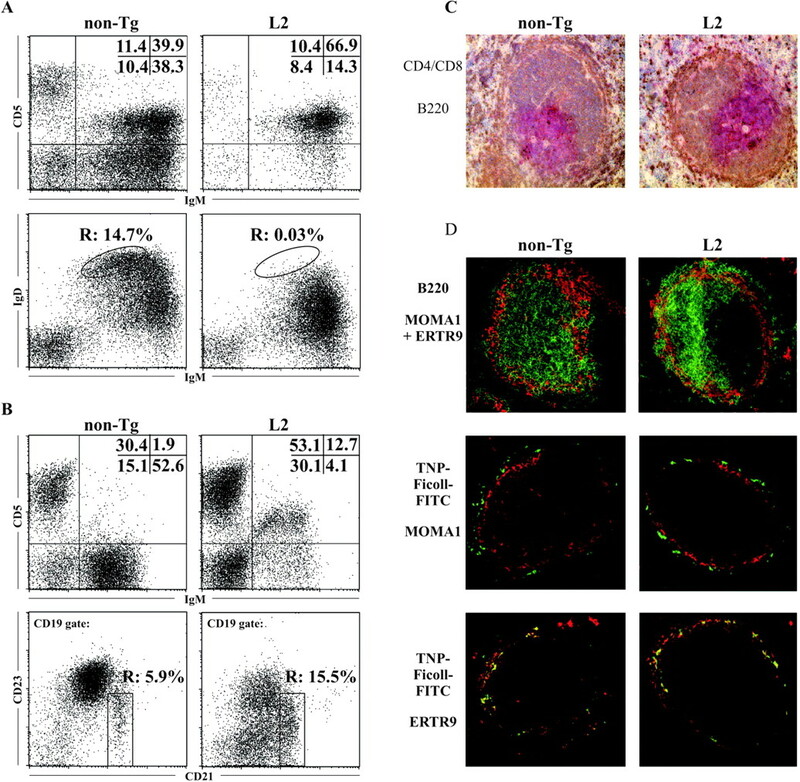 Transgenic (Tg) L2 mice expressing high levels of the λ2 (315) L chain contain only B cell populations involved in the first line of defense, i.e., B-1 and marginal zone (MZ) B cells. The strongly oligoclonal IgH chain repertoire of Tg B-1a cells in such mice was attributed to strong positive selection by autoantigens. In this study, we show that the MZ B cells of L2 mice correspond very closely to MZ B cells of normal mice, as revealed by surface marker expression and gene expression profiling. We demonstrate that the IgH chain repertoire of these Tg MZ B cells is extremely heterogeneous. This is in sharp contrast to the oligoclonality found in B-1a cells of the same mice, which was attributed to strong positive selection mediated by autoantigens. Therefore, the strong positive selection of the IgH chain repertoire in L2 mice is B-1a specific. Thus, our data demonstrate that despite common functional properties, MZ B and B-1a cells exhibit striking differences in their selection and/or maintenance requirements. Naive mature B lymphocytes in the spleen can be divided into B-2 and B-1 cells based on phenotypic and functional characteristics that coincide with different developmental and maintenance requirements (1, 2). Within the B-2 compartment, additional subpopulations can be defined such as recirculating follicular (FO)4 B lymphocytes located in the lymphoid follicles and CD23low/−CD21high B cells primarily enriched in the marginal zone (MZ). The MZ is a distinct anatomical compartment that in mice is only found in the spleen and surrounds the B cell follicles and the periarteriolar T cell areas (3). Due to their specialized location near the marginal sinus and their association with a broad spectrum of various other cell types including endothelial cells, dendritic cells, and macrophages, MZ B cells are designated to exposure to blood-borne Ags (3). Functional and anatomical differences could suggest that MZ and FO B cells represent separate B cell lineages. However, to date no source has been defined that preferentially provides progenitors for one and not the other subset. Replenishment of MZ B cells is best achieved by transfer of thoracic duct lymphocytes (4). High expression levels of LFA-1 (αLβ1) and α4β1 during the development of MZ B cells have been shown to be crucial for this recruitment (5). MZ B cells display a preactivated phenotype (6), and it was suggested that they develop by recruitment from and activation of recirculating FO B cells (7, 8). Requirement for activation is consistent with reduced numbers of MZ B cells in mice deficient for genes such as Pyk2, Lsc, Aiolos, NF-κB p50, RelB, CD22, CD19, and Dock2, and an enlarged MZ B cell compartment in BTK−/− and CD21−/− mice, suggesting that continuous interactions via the B cell receptor (BCR) might be required for MZ B cell generation and/or maintenance (reviewed in Ref. 3). It has been demonstrated in IgH chain transgenic (Tg) mice that BCR specificity plays an important role in B cell fate. Depending on the nature of the Tg, B cells may segregate into either the MZ or the FO B cell population (9). Similarly, the B-1 vs B-2 segregation was shown to be dependent on BCR specificity and surface density (10, 11, 12). Not only MZ B cell development, but also the generation and/or maintenance of B-1a cells are influenced by BCR signals, as suggested by mutations of components of the BCR signaling cascade, BCR coreceptors, and negative regulators of the BCR complex (10). Despite the commonalities, differences between MZ B and B-1a cells do exist. For example, Pyk2−/− mice (13) and mice Tg for the soluble form of transmembrane activator and CAML interactor (14) lack MZ B cells, whereas B-1a cell numbers are not affected. Conversely, Btk-dependent signals are required for the development of B-1a, but are not necessary for development of MZ B cells (15). These data appear to be consistent with the view that Ags influence the FO vs MZ and B-2 vs B-1 B cell decision in that both MZ and B-1a cells are selected into a particular microenvironment by a process that is at least partially BCR ligand dependent. The resulting B cells would ensure rapid development of short-term first line of defense responses to a limited number of conserved Ags (3, 6). B-1a and MZ B cells often express polyreactive specificities with low affinities to a broad range of Ags, including bacterial-derived T cell-independent type II (TI-2) Ags as well as self Ags. This suggests that self Ags might play an important role in establishing the B cell repertoire of the B-1a and MZ B cell subset, and might also explain why in animals deprived of exogenous Ags B-1a and MZ B cells still develop (16, 17). Consistently, it was recently shown that the generation of a particular B-1a specificity depends on the interaction with autoantigens (18). Despite accumulating evidence for BCR ligand-driven MZ B cell development, a comprehensive analysis of CD21highCD23low MZ B cells with regard to VH usage and complementarity-determining region 3 (CDR3) diversity has not been performed to date. Previous repertoire studies on MZ B cells in mice have been limited to the analysis of Ig somatic hypermutations (15) or in rats were hampered by the limited availability of genomic sequence information of the IgH locus (e.g., only a single genomic D gene sequence is described in the rat, although more D gene segments do exist; thus, conclusions about nontemplated (N) nucleotide additions are very limited) (8). We have recently shown that L2 mice, characterized by high expression of the Tg λ2 (315) L chain, exhibit a predominance of B-1a cells that almost exclusively express the Tg (12). The Tg L chain expressing peritoneal B-1a cells of adult L2 mice shows a pronounced oligoclonal IgH chain repertoire (19). The high frequency of independent VHDJH rearrangements encoding the same VH chains was interpreted to be due to strong positive selection mediated by autoantigens. In this study, we describe the presence of an initially disregarded B cell population in the spleen of L2 mice that corresponds to CD23low/−CD21high MZ B cells of normal mice by the criteria of surface marker expression and gene expression profile. When analyzing IgH chain sequences of λ2 L chain Tg MZ B cells and MZ B cells from normal mice, we found them to be heterogeneous in both samples. Comparing the Ab repertoire of MZ B cells and splenic B-1a cells from L2 mice, we observed that their IgH chain repertoire was drastically different, indicating that both subsets are selected by different mechanisms. Heterozygous λ2 L chain Tg L2 mice, non-Tg littermates were used at 8–10 wk of age. IEκT and L2 × IEKT mice were used at 7 mo of age and were backcrossed on the BALB/c background for at least 5 and 8 generations, respectively. Both strains carry the IgHa allotype. L2 mice were backcrossed on the BALB/c background for 20–25 generations. The mAb against IgM (Igh-6a), IgD (AMS 9.1), CD5 (53-7.3), B220 (RA3-6B2), CD21/CD35 (7G6), CD23 (B3B4), and CD19 (1D3) were obtained from BD PharMingen (San Diego, CA). Flow cytometry was conducted using a FACSCalibur and CellQuest software (BD Biosciences, San Diego, CA). Cell sorting was performed on a MOFLO (Cytomation, Fort Collins, CO) or a FACSVantage (BD Biosciences). Reanalysis revealed that sorted cells were >97–98% pure. For Ag localization, L2 and non-Tg littermates were injected i.v. with 100 μg of 2,4,6-trinitrophenyl (TNP)-Ficoll-FITC (Biosearch Technologies, Novato, CA), and spleens were taken 30 min later. For histological examination, TNP-Ficoll-FITC and anti-B220-FITC were detected on frozen sections using the TSA Fluorescein System (NEN Life Sciences, Boston, MA). Sections were additionally stained with biotinylated anti-ERTR9, anti-MOMA-1 (both Biomedicals, Augst, Switzerland), and anti-B220 (BD PharMingen) Abs. Biotinylated Abs were visualized with streptavidin-Cy3 (Dianova, Hamburg, Germany). Some spleen sections were stained with CD4/CD8 (GK1.5/53-6.72) (BD PharMingen) + anti-rat coupled to alkaline phosphatase (BD PharMingen) + VectorBlue substrate (Vector Laboratories, Burlingame, CA) and B220-FITC (RA3-6B2) (BD PharMingen) + HRP-conjugated anti-FITC mAb + diaminobenzidine substrate (Sigma-Aldrich, St. Louis, MO). RNA isolation, generation of cRNA, and microarray hybridization were performed, as described previously (20, 21). In brief, total RNA was extracted from 1.5 × 105 sorted B220+CD21highCD23low MZ B cells of L2 and normal mice and used for mRNA amplification by two subsequent rounds of cDNA synthesis and in vitro transcription. The samples were then hybridized to high density oligonucleotide arrays (Affymetrix U74Av2). Processing of scanned raw data images, normalization, and assessment of differential expression were done, as previously described (21). CD19+CD23+CD21intermediate cells from spleens of BALB/c mice were sorted and used for cloning and sequencing of PCR-amplified IgH chains. Single-cell RT-PCR for amplification of VHDJH μ-chain transcripts was conducted, as described previously, using the Qiagen (Valencia, CA) OneStep RT-PCR kit (21). In brief, CD21highCD23low/− MZ B cells were purified by a two-step FACS-sorting procedure to ensure deposition of single cells into PCR strips containing RNase-free water, the supplied buffer, and RNAsin. Reverse transcription and PCR were performed in a one-step reaction after RNase-free water, dNTPs, Qiagen OneStep RT-PCR enzyme mix, the oligonucleotides VHcons and Cμ1, and the supplied buffer were added. For the second amplification, 1 μl of first-round RT-PCR product was added to a 20 μl mix containing dNTPs, Hot Star Taq (Qiagen), the supplied buffer, and the VHcons oligonucleotide in combination with the internal Cμ2 C region primer. Purification of amplification products, sequencing, sequence analysis, and sequence comparison were done, as described previously (19). Sequence data of MZ B cells from L2 (pool of three mice), BALB/c (pool of three mice and single mouse), IEκT, L2 × IEκT, and splenic FO B cells from BALB/c mice are available in GenBank under accession AY171958-AY172018, AY171919-AY171957, AY369946-AY369976, AY369881-AY369907, AY369908-AY369945, and AY369857-AY369878, respectively. B cell development in the bone marrow (BM) of adult L2 mice was found to be severely impaired at the transition from large to small preB-II cells (12). The peritoneal B cell compartment of such mice was predominantly composed of CD5+ B-1 cells, whereas CD5−IgMlowIgDhigh B-2 cells were completely absent (Fig. 1⇓A). Also, the splenic B cell compartment of L2 mice was dominated by CD5+ B-1 cells (Fig. 1⇓A) (12). However, ∼5% of splenic cells were CD5−IgM+, and cells exhibiting the CD23low/−CD21high MZ surface marker phenotype contributed to the splenic B cell population (Fig. 1⇓B). Such cells were IgMhighIgDlowCD1high, and expressed, when compared with MZ B cells from normal mice, even higher levels of CD80 and CD86 (data not shown). Distribution of MZ, B-1, and B-2 cells in L2 and non-Tg mice. A, Complete absence of CD5−IgMlowIgDhigh B-2 cells in the peritoneum of L2 mice. CD5−IgMhighIgDlow B-1b cells are present at a low frequency. The numbers represent the percentage of cells in the lymphoid gate in the particular quadrant or gate. B, In addition to CD5+ B-1 cells, CD23low/−CD21high MZ B cells contribute to the splenic B cell compartment of L2 mice. For the upper panels, the percentage of cells in the lymphoid gate in the particular quadrant is shown, whereas the lower panels in addition are gated on CD19 expression. Like in normal mice (11 ), part of splenic B-1a cells of L2 mice is CD23+, and a part is CD23−. C, Histological examination of splenic architecture of L2 and normal mice using anti-CD4/anti-CD8 (red) and anti-B220 (brown) Abs. D, MZs of L2 and non-Tg littermates are comparable in their capacity to capture TI-2 Ags. Splenic B cell follicles (green) of L2 and normal mice are surrounded by a rim of metallophilic and MZ macrophages (red) (upper panel). In both L2 and normal mice, TNP-Ficoll-FITC (green) is localized outside of the MOMA1+ metallophilic macrophage rim (red) (middle panel), but inside of the ERTR9+ MZ macrophage rim (red) (lower panel) and partially colocalizes with MZ macrophages (yellow). Spleens of mice that were injected with PBS were used as controls for the specificity of TNP-Ficoll-FITC detection (data not shown). In agreement with the identification of CD23low/−CD21high B cells by flow cytometry, histological examination demonstrated the presence of a MZ in the spleen of L2 mice (Fig. 1⇑, C and D). Intravenously injected TI-2 Ags rapidly localize to MZ macrophages and MZ B cells in normal mice, but not in mice deficient for MZ B cells (13, 22). Such targeting of MZ B cells probably occurs by a complement-dependent mechanism and independent of their BCR specificity (13). Intravenous injection of TNP-Ficoll-FITC revealed that L2 mice are capable of localizing this TI-2 model Ag in the MZ just like normal mice do (Fig. 1⇑D), further confirming the presence of a functional MZ in Tg L2 mice. To further determine whether MZ B cells from Tg mice are similar to MZ B cells from normal mice, we compared the gene expression profile of MZ B cells from L2 mice with the corresponding B cell population of normal mice. To this end, RNA samples of both CD23low/−CD21high B cell populations were hybridized to high density oligonucleotide arrays interrogating 12,488 transcripts. Comparison of the gene expression profiles using normalized expression values of triplicate analysis revealed an extremely close relationship. Assessment of differentially expressed genes using the program Significance Analysis of Microarrays (SAM) (23) indicated that no gene is found to be differentially expressed between MZ B cells from L2 and normal mice. With Δ = 2 and a fold change parameter of 3, there is only 1 gene called, but ∼0.97 false positives, which represents a false detection rate of 97%. In contrast, comparison of the gene expression profiles of MZ B cells from L2 mice with previously described gene expression profiles of splenic B-1a of L2 mice and splenic B-2 cells of normal mice (21) revealed substantial differences using the same significance and fold change parameters (Fig. 2⇓). Between MZ B and splenic B-1a cells and MZ B cells of L2 mice with B-2 cells, 116 and 146 significant genes were determined, respectively. Similarly, comparison of splenic B-1a cells with splenic B-2 cells revealed 381 significant genes. Gene expression profile of MZ B cells from L2 mice corresponds to that of MZ B cells from normal mice. Assessment of differentially expressed genes was done by the nonparametric, permutation-based method of Tusher et al. (23 ) using SAM. To control for multiple testing, a false discovery rate was calculated as the percentage of false positive genes among all genes detected as differentially expressed. For all comparisons, the same significance and fold change parameters were used (Δ = 2, at least 3-fold regulated). SAM analysis did not reveal any significant difference between MZ B cells from L2 and normal mice. Using SAM, a multiclass comparison of these four splenic B cell populations was performed, and the ∼500 transcripts identified as being differentially expressed were analyzed for the presence of genes with known expression pattern (data not shown). CD5 was found to be up-regulated in B-1a cells, but below detection in the other subpopulations. CD21 was up-regulated in both Tg and non-Tg MZ B cells. B-2 cells exhibited low expression levels of CD9, whereas the B-1a and MZ B cell subpopulations showed high expression levels of this marker. Thus, these transcripts showed the expected array-based expression patterns (1, 24). A cluster of 21 Ig transcripts, mainly κL chains, was found to be expressed in splenic B-2 cells and MZ B cells of normal mice, respectively, but expression values below detection levels in the B cell subsets from L2 mice. This is consistent with the virtually exclusive expression of the λ2 L chain in Tg mice, which underlines the validity of our expression data. There is growing evidence for BCR selection playing an important role in MZ B cell development. Consistently, the Ab repertoire of MZ B cells is thought to be heavily influenced through positive selection by Ag (3, 6). This should become especially apparent in L2 mice due to the virtually exclusive availability of the single Tg L chain. 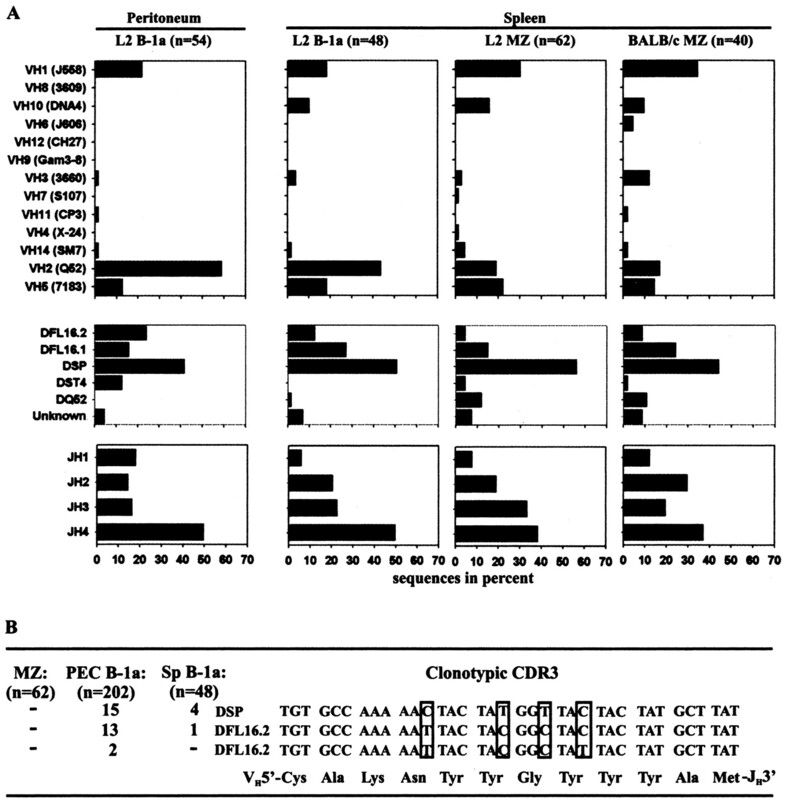 Therefore, the IgH chain repertoire of MZ B cells of L2 mice was analyzed and compared with the previously determined repertoire of B-1a cells from the same mice (19, 21). Individual CD21highCD23low/− MZ B cells of L2 and non-Tg mice were isolated from pools of three mice each, and μH chain transcripts were amplified by single cell RT-PCR. For L2 and non-Tg mice, a total of 61 and 40 IgH chain sequences, respectively, was established in this way. The pattern of VH, D, and JH gene segments representing the IgH chains from MZ B cells was then compared with the pattern obtained with splenic and peritoneal B-1a cells of L2 mice (21). B-1a cells from Tg and non-Tg mice exhibited a severe overrepresentation of VHDJH rearrangements involving VHQ52 in association with JH4 (Fig. 3⇓A) (19). In contrast, both MZ B cell populations used most frequently VH gene segments of the J558 family, similar to B-2 cells (25). Overall, the pattern of VH, D, and JH gene segments in Tg and non-Tg MZ B cells was very similar (Fig. 3⇓ and data not shown). Comparative IgH chain repertoire analysis. A, Pattern of VH, D, and JH gene segments engaged in IgH chains of peritoneal and splenic B-1a cells from L2 mice, and MZ B cells from L2 and normal mice. For peritoneal B-1a cells, the result of a single SC RT-PCR experiment is shown. B, Clonotypic IgH chains can easily be recovered from splenic and peritoneal B-1a cells, but not from MZ B cells of L2 mice. As an example of oligoclonal B-1a specificities (for additional oligoclonal sequences, see Refs. 19 and 21 ), the CDR3 nucleotide and amino acid sequence of a VHQ52-D-JH4 rearrangement and its distribution within the peritoneal B-1a, splenic B-1a, and MZ B cell compartment of L2 mice is indicated. This exemplified IgH chain amino acid sequence represents ∼14% of sequences in three independent experiments in which a total of 250 IgH chains was analyzed (95% confidence level: 10.3–19.4%). This oligoclonal IgH chain amino acid sequence was not found in the data set from MZ B cells of L2 mice (95% confidence level: 0.0–5.8%). IgH chains of MZ B cells from L2 mice showed a higher degree of CDR3 diversity due to the introduction of N nucleotide insertions when compared with B-1a cells (Table I⇓). Considering only D-JH junctions (to avoid the possibility that VH gene segments with unknown germline 3′ ends might bias the analysis of N nucleotides in VH D junctions), 32.3% of IgH chain sequences of MZ B cells from L2 mice exhibited no N nucleotide insertions, while 81.4 and 63.5% of peritoneal and splenic B-1a cells, respectively, do not exhibit such insertions (Table I⇓) (19). Interestingly, N nucleotide insertions are much more frequent in IgH chains from MZ B cells of L2 mice (59.6%) compared with their counterparts from normal mice (25.0%). Given that the current model of MZ B cell development is based on their selection from adult BM-derived B cells, the low frequency of N nucleotides in IgH chains appears to be surprising. Table I⇑ shows that approximately one-half of the IgH chains analyzed from MZ B cells of normal mice did not exhibit N nucleotides in their D-JH junctions (pool of three mice, 55.0%, n = 40; single mouse, 50.0%, n = 32). In fact, a similar low frequency of N nucleotides can be found in peritoneal B-1a cells of normal mice (63.5%, n = 85), whereas very few splenic FO B cells exhibit D-JH junctions with no N nucleotides (12.0%, n = 25) (Table I⇑) (19, 25, 26). The absence of TdT activity in fetal liver is associated with an increase in the frequency of recombinational junctions, in which short stretches of nucleotides could have derived from either germline gene segment because of an overlap of identical nucleotide sequences at the coding ends. Consistently, the frequency of such homology-directed junctions appears to be comparable between MZ B cells and peritoneal B-1a cells of non-Tg mice (MZ B, 27.5%; B-1a, 30.6%). 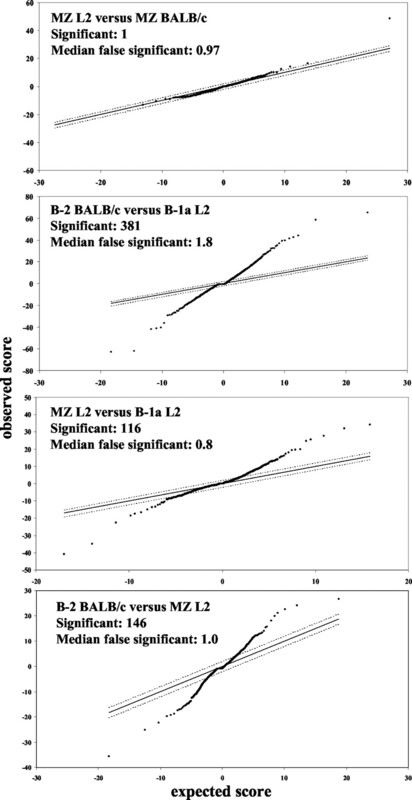 The most striking difference between MZ B and B-1a cells from L2 mice was that the IgH chain repertoire of MZ B cells did not reveal any evidence for expanded or selected B cell clones. The 61 IgH chains analyzed exhibited VHDJH rearrangements, each displaying a unique CDR3, just like MZ B cells from non-Tg control mice. Only one VHDJH nucleotide sequence was recovered twice from L2 mice. This IgH chain displayed N nucleotide insertions in both VH-D and D-JH junctions as well as JH nibbling, and was most likely derived from an expanded clone (data not shown). No homology groups based on the amino acid sequence of VH regions could be found in MZ B cells from L2 and non-Tg mice. In sharp contrast, in Tg B-1a cells, 44.4 and 15.0% of IgH chains of peritoneal and splenic B-1a cells, respectively, could be assigned to homology groups with identical or very similar amino acid sequences (21). In addition, B-1a cells of L2 mice exhibited a high frequency of independent rearrangements that resulted either in identical nucleotide sequences or identical amino acid sequences despite nucleotide differences (Fig. 3⇑B). These identical IgH chain sequences could be reproducibly recovered at similar high frequencies from independent experiments. The exemplified IgH chain shown in Fig. 3⇑B represents ∼15% of sequences in three independent experiments, in which a total of 202 IgH chains was analyzed (19, 21) (our unpublished observations). Such a redundancy was not observed with any IgH chain sequence from Tg MZ B cells (data not shown and Fig. 3⇑B). MZ B cells of L2 mice also do not share any IgH chain sequence with those obtained from either splenic or peritoneal B-1a cells of L2 mice (Fig. 3⇑B and data not shown), while up to 17.3% of splenic B-1a-derived sequences were identical with IgH chains recovered from peritoneal B-1 cells (21). Thus, MZ B cells of L2 and non-Tg mice do not appear to show any evidence for a restricted IgH chain repertoire. To exclude that in normal mice clones of MZ B cells selected in individual mice are diluted out by using pools of MZ B cells from several mice, a single non-Tg mouse was used for sorting of CD21highCD23low/− MZ B cells and IgH repertoire analysis. However, the data set of 32 IgH chains established by single cell (SC) RT-PCR did not reveal any evidence of dominating B cell clones or homologous CDR3 amino acid sequences. Each sequence was characterized by a unique CDR3 amino acid sequence (data not shown). The lack of oligoclonal IgH chains might be due to an increased expression of endogenous κL chains in the MZ B cell population of L2 mice. However, B-1a and MZ B cells of spleens from L2 mice show similar frequencies of B cells expressing a κL chain in addition to the Tg λL chain on their surface (MZ B cells, 14.7 ± 0.9%, n = 3; B-1a, 14.9 ± 0.8%, n = 3) (data not shown). To further confirm that the diverse IgH chain repertoire of MZ B cells from L2 mice was not due to reinforced expression of endogenous κL chains, κL chain-deficient L2 mice were generated by crossing L2 mice to IEκT mice that only produce λL chains due to a deletion of the Igκ chain intron enhancer. Flow cytometric analysis indicated that B cells present in such mice only express the Tg λ2 L chain (data not shown). A single L2 × IEκT mouse was used for sorting of CD21highCD23low/− MZ B cells. This mouse was 7 mo old to allow sufficient time for the potential selection of B cells into the MZ B cell compartment. However, the data set of 38 IgH chains established by SC RT-PCR also did not reveal any evidence of dominating B cell clones or homologous CDR3 amino acid sequences. Only two sequences were found to be identical. Thus, the lack of oligoclonal IgH chains was not due to an increased expression of endogenous κL chains in the MZ B cell population of L2 mice. The lack of oligoclonality in MZ B cells of L2 mice might be due to a special feature of the somatically mutated Tg λ2 L chain of the plasmacytoma MOPC 315 or the high expression level of the Tg. Therefore, we analyzed the IgH chain repertoire of MZ B cells from a 7-mo-old IEκT mouse, in which B cells exhibit a quasimonoclonal IgL chain repertoire by almost exclusively expressing Vλ1-Jλ1 or Vλ2-Jλ2 rearrangements. Again, only 2 of 38 IgH chain nucleotide sequences analyzed were found to be identical, and no evidence for oligoclonality was observed. In conclusion, MZ B cells do not show any evidence for a restricted IgH chain repertoire when expressing only one particular Tg L chain, which argues against strong positive selection by autoantigens (3, 6). BCR specificities of MZ B cells are clearly distinct from specificities of B-1a cells, indicating that they are differently selected for different function. L2 mice expressing the Tg λ2 (315) L chain in the vast majority of B cells have proven to be a useful model to study the selection of B cells that are believed to be involved in the first line of Ab defense (19). In this study, we show that in addition to peritoneal and splenic B-1a cells, these mice contain normal levels of MZ B cells in their spleen, while B-2 B cells are largely absent. The block of B cell development observed in adult BM of L2 mice resembles that observed in mice, in which the RAG-2 gene has been inactivated at birth. When such mice become adult they are likewise highly enriched in B-1a and MZ B cells (27). However, due to the usage of a single L chain in L2 mice, we could study previously unknown details of the selection of these two distinct B cell subsets. It has been concluded that MZ, B-1, and FO B cell subsets are strongly influenced by signals from environmental and/or autoantigens (3). Thus, particular specificities are preferentially selected into the MZ B cell compartment, as shown in mice Tg for VH81X/Vκ1c- and VHS107/Vκ24-encoded Ab specificities (9). Similarly, the repertoire of peritoneal B-1a cells was found to be enriched with canonical receptors, including specificities for phosphatidylcholine, phosphorylcholine, and a Thy-1-associated epitope (18, 28, 29), whereas other specificities were poorly selected into the B-1a compartment, such as MD2 or 81x when introduced as VH transgenes (30, 31). From the data available, one might have predicted a restricted IgH chain repertoire in MZ B cells as well as B-1a cells. However, despite the fact that MZ B cells from normal mice exhibit surprisingly few N nucleotide insertions and a high frequency of homology-directed D-JH junctions, which both are comparable to peritoneal B-1a cells, no evidence for Ab repertoire restriction was found, even when analyzing a single mouse. Such repertoire restriction should become apparent especially under conditions when most cells express the Tg λ2 L chain, as in L2 mice. In previous experiments, we could show that this is indeed the case for splenic and peritoneal B-1a cells (19, 21). However, in this study, we show that in contrast to the data with B-1a cells, the IgH chain repertoire of MZ B cells in L2 mice is extremely heterogeneous, with only one sequence being observed twice. This was even more unexpected, as in a recent report the L chain repertoire in mice expressing a Tg IgH chain selecting into the MZ B cell compartment was highly restricted (9). There are several reasons that we believe that the MZ B cells in L2 mice are representative of MZ B cells in normal mice: First, it appears that the former and the latter exhibit a very similar gene expression profile. Second, there is similar usage of VH, D, and JH gene segments by MZ B cells from L2 and normal mice. There is, however, a higher frequency of IgH chains with N nucleotide insertions (59.6 vs 25.0%) in the L2 mice, which would be explained by the assumption that a more diverse repertoire of MZ B cells can be selected when FO B cells are absent. The latter would also explain the higher expression levels of the CD80 and CD86 activation markers on MZ B cells from L2 mice compared with normal mice. With regard to this, a similar preactivated phenotype of B cells has been observed in mice that exhibit only small numbers of mature B cells (27, 32). The presence of a normal MZ B cell compartment in L2 mice, despite the severe block in B cell development in adult BM and the extremely low frequency of N nucleotide insertions in MZ B cells from normal mice, strongly suggests that the origin of MZ B cells is heterogeneous. According to the current idea, enhanced BCR signaling facilitates FO B cell maturation, whereas FO B cells that do not receive strong BCR signals differentiate into MZ B cells (6, 33). However, the MZ B cells from L2 mice indicate the presence of a developmental pathway independent of B cell development in adult BM and recruitment from FO B cells. In agreement, BM-derived C1qRp+ (AA4.1, 493) immature B cells that would give rise to FO B cells are below detection level in the spleen of L2 mice (Ref. 12 and data not shown). The presence or absence of N nucleotides also suggests a heterogeneous origin: some MZ B cells are generated from fetal sources and around birth in the absence and/or at the beginning of TdT expression. Others are generated in adult BM, when the enzyme TdT is constitutively active. Consistently, B cells expressing an IgM Tg derived from fetal liver B cells are preferentially selected into the MZ (34), and progenitors from both fetal liver and adult BM equally reconstitute the MZ B cell population (4, 35, 36). Hence, designated MZ B cell precursors might be recruited into the developing MZ at 2–3 wk of age, because the MZ in mice usually does not develop before this time point in ontogeny (37). The presence of MZ B cells in mice in which RAG-2 had been deleted at birth for up to 28 wk indicates that MZ B cells generated early in mouse development can be maintained for a long time, similar to the self-renewing B-1a population (27). Despite relatively high frequencies of N nucleotide insertions, the MZ B cells present in L2 mice might therefore well be generated early in mouse development, before and around birth, in the absence and/or at the beginning of TdT expression. Thus, they need not have bypassed the block in B cell development in adult BM of L2 mice (12). In conclusion, MZ B cells from normal mice that exhibit no N nucleotides and the MZ B cells from L2 mice appear not to originate from adult BM-derived mature naive B cells, but are generated in early mouse development by a to date unknown developmental pathway. Experiments with genetically manipulated mice that lack either fetal or adult B cell development should help to gain insight in such mixed origin of MZ B cells. The substantial IgH chain diversity of MZ B cells despite the exclusive expression of the Tg L chain underlines the different requirements of MZ B and B-1a cells to be selected into the respective B cell subset. The growing evidence for selection playing an important role in MZ B cell development and the lack of BCR oligoclonality might indicate that MZ B cells are selected by a more heterogeneous group of exogeneous blood-borne Ags, whereas the selection of B-1a cells appears to be mainly mediated by relatively conserved autoantigens. Alternatively, ligands binding to receptors others than the BCR, e.g., pattern-recognition receptors, might be responsible for mediating positive selection of the first line of defense MZ B cell subpopulation. No overlaps of specificities have been observed between both B cell subsets in L2 mice. We conclude therefore that although MZ B and B-1a cells mediate first line of defense, they considerably differ in their selection requirements, suggesting that both subsets are responsive to different types of pathogens. The expert technical assistance of Susanne zur Lage, Regina Lesch, Maria Höxter, Lothar Gröbe, Hubertus Kohler, Tracy Hayden, and Stephanie Thies is gratefully acknowledged. We also thank Harald von Boehmer for critically reading our manuscript and Claudia Berek for helpful advice in histology. We also gratefully acknowledge Ulrich Certa at F. Hoffmann-LaRoche (Basel, Switzerland) for providing the facility for gene expression analysis. Part of the expression analysis was performed at the Basel Institute for Immunology. ↵1 This work was partly supported by grants from Deutsche Forschungsgemeinschaft and Bundesministerium für Bildung und Forschung. Part of the expression analysis was performed at the Basel Institute for Immunology that was founded and supported by F. Hoffmann-LaRoche. ↵3 Current address: Department Bacteriology, Max-von-Pettenkofer-Institut, Pettenkoferstrasse 9a; D-80336 Munich, Germany. ↵4 Abbreviations used in this paper: FO, follicular; BCR, B cell receptor; BM, bone marrow; CDR3, complementarity-determining region 3; MZ, marginal zone; N, nontemplated; SAM, Significance Analysis of Microarrays; SC, single cell; Tg, transgene/transgenic; TI-2, T cell-independent type II; TNP, 2,4,6-trinitrophenyl. Martin, F., J. F. Kearney. 2001. B1 cells: similarities and differences with other B cell subsets. Curr. Opin. Immunol. 13:195. Berland, R., H. H. Wortis. 2002. Origins and functions of B-1 cells with notes on the role of CD5. Annu. Rev. Immunol. 20:253. Martin, F., J. F. Kearney. 2002. Marginal-zone B cells. Nat. Rev. Immunol. 2:323. Kumararatne, D. S., I. C. MacLennan. 1981. Cells of the marginal zone of the spleen are lymphocytes derived from recirculating precursors. Eur. J. Immunol. 11:865. Lu, T. T., J. G. Cyster. 2002. Integrin-mediated long-term B cell retention in the splenic marginal zone. Science 297:409. Martin, F., J. F. Kearney. 2000. B-cell subsets and the mature preimmune repertoire: marginal zone and B1 B cells as part of a “natural immune memory.”. Immunol. Rev. 175:70. Mason, D. Y., M. Jones, C. C. Goodnow. 1992. Development and follicular localization of tolerant B lymphocytes in lysozyme/anti-lysozyme IgM/IgD transgenic mice. Int. Immunol. 4:163. Dammers, P. M., N. K. de Boer, G. J. Deenen, P. Nieuwenhuis, F. G. Kroese. 1999. The origin of marginal zone B cells in the rat. Eur. J. Immunol. 29:1522. Martin, F., J. F. Kearney. 2000. Positive selection from newly formed to marginal zone B cells depends on the rate of clonal production, CD19, and btk. Immunity 12:39. Wortis, H. H., R. Berland. 2001. Cutting edge commentary: origins of B-1 cells. J. Immunol. 166:2163. Hardy, R. R., K. Hayakawa. 2001. B cell development pathways. Annu. Rev. Immunol. 19:595. Engel, H., B. Bogen, U. Muller, J. Andersson, A. Rolink, S. Weiss. 1998. Expression level of a transgenic λ2 chain results in isotype exclusion and commitment to B1 cells. Eur. J. Immunol. 28:2289. Guinamard, R., M. Okigaki, J. Schlessinger, J. V. Ravetch. 2000. Absence of marginal zone B cells in Pyk-2-deficient mice defines their role in the humoral response. Nat. Immun. 1:31. Schneider, P., H. Takatsuka, A. Wilson, F. Mackay, A. Tardivel, S. Lens, T. G. Cachero, D. Finke, F. Beermann, J. Tschopp. 2001. Maturation of marginal zone and follicular B cells requires B cell activating factor of the tumor necrosis factor family and is independent of B cell maturation antigen. J. Exp. Med. 194:1691. Makowska, A., N. N. Faizunnessa, P. Anderson, T. Midtvedt, S. Cardell. 1999. CD1high B cells: a population of mixed origin. Eur. J. Immunol. 29:3285. MacLennan, I. C., D. Gray. 1986. Antigen-driven selection of virgin and memory B cells. Immunol. Rev. 91:61. Hayakawa, K., Y. S. Li, R. Wasserman, S. Sauder, S. Shinton, R. R. Hardy. 1997. B lymphocyte developmental lineages. Ann. NY Acad. Sci. 815:15. Hayakawa, K., M. Asano, S. A. Shinton, M. Gui, D. Allman, C. L. Stewart, J. Silver, R. R. Hardy. 1999. Positive selection of natural autoreactive B cells. Science 285:113. Kretschmer, K., H. Engel, S. Weiss. 2002. Strong antigenic selection shaping the immunoglobulin heavy chain repertoire of B-1a lymphocytes in λ2(315) transgenic mice. Eur. J. Immunol. 32:2317. Hoffmann, R., T. Seidl, M. Neeb, A. Rolink, F. Melchers. 2002. Changes in gene expression profiles in developing B cells of murine bone marrow. Genome Res. 12:98. Kretschmer, K., A. Jungebloud, J. Stopkowicz, B. Stoermann, R. Hoffmann, S. Weiss. 2003. Antibody repertoire and gene expression profile: implications for different developmental and functional traits of splenic and peritoneal B-1 lymphocytes. J. Immunol. 171:1192. Samardzic, T., D. Marinkovic, C. P. Danzer, J. Gerlach, L. Nitschke, T. Wirth. 2002. Reduction of marginal zone B cells in CD22-deficient mice. Eur. J. Immunol. 32:561. Tusher, V. G., R. Tibshirani, G. Chu. 2001. Significance analysis of microarrays applied to the ionizing radiation response. Proc. Natl. Acad. Sci. USA 98:5116. Won, W. J., J. F. Kearney. 2002. CD9 is a unique marker for marginal zone B cells, B1 cells, and plasma cells in mice. J. Immunol. 168:5605. Kantor, A. B., C. E. Merrill, L. A. Herzenberg, J. L. Hillson. 1997. An unbiased analysis of VH-D-JH sequences from B-1a, B-1b, and conventional B cells. J. Immunol. 158:1175. Tornberg, U. C., D. Holmberg. 1995. B-1a, B-1b and B-2 B cells display unique VHDJH repertoires formed at different stages of ontogeny and under different selection pressures. EMBO J. 14:1680. Hao, Z., K. Rajewsky. 2001. Homeostasis of peripheral B cells in the absence of B cell influx from the bone marrow. J. Exp. Med. 194:1151. Pennell, C. A., T. J. Mercolino, T. A. Grdina, L. W. Arnold, G. Haughton, S. H. Clarke. 1989. Biased immunoglobulin variable region gene expression by Ly-1 B cells due to clonal selection. Eur. J. Immunol. 19:1289. Masmoudi, H., T. Mota-Santos, F. Huetz, A. Coutinho, P. A. Cazenave. 1990. All T15 Id-positive antibodies (but not the majority of VHT15+ antibodies) are produced by peritoneal CD5+ B lymphocytes. Int. Immunol. 2:515. Goodnow, C. C., J. Crosbie, S. Adelstein, T. B. Lavoie, S. J. Smith-Gill, R. A. Brink, H. Pritchard-Briscoe, J. S. Wotherspoon, R. H. Loblay, K. Raphael. 1988. Altered immunoglobulin expression and functional silencing of self-reactive B lymphocytes in transgenic mice. Nature 334:676. Martin, F., X. Chen, J. F. Kearney. 1997. Development of VH81X transgene-bearing B cells in fetus and adult: sites for expansion and deletion in conventional and CD5/B1 cells. Int. Immunol. 9:493. Agenes, F., A. A. Freitas. 1999. Transfer of small resting B cells into immunodeficient hosts results in the selection of a self-renewing activated B cell population. J. Exp. Med. 189:319. Cariappa, A., M. Tang, C. Parng, E. Nebelitskiy, M. Carroll, K. Georgopoulos, S. Pillai. 2001. The follicular versus marginal zone B lymphocyte cell fate decision is regulated by Aiolos, Btk, and CD21. Immunity 14:603. Chen, X., F. Martin, K. A. Forbush, R. M. Perlmutter, J. F. Kearney. 1997. Evidence for selection of a population of multi-reactive B cells into the splenic marginal zone. Int. Immunol. 9:27. Kroese, F. G., N. K. de Boer, T. de Boer, P. Nieuwenhuis, A. B. Kantor, G. J. Deenen. 1995. Identification and kinetics of two recently bone marrow-derived B cell populations in peripheral lymphoid tissues. Cell. Immunol. 162:185. Takahashi, K., Y. Kozono, T. J. Waldschmidt, D. Berthiaume, R. J. Quigg, A. Baron, V. M. Holers. 1997. Mouse complement receptors type 1 (CR1;CD35) and type 2 (CR2;CD21): expression on normal B cell subpopulations and decreased levels during the development of autoimmunity in MRL/lpr mice. J. Immunol. 159:1557. MacLennan, I. C., H. Bazin, D. Chassoux, D. Gray, J. Lortan. 1985. Comparative analysis of the development of B cells in marginal zones and follicles. Adv. Exp. Med. Biol. 186:139.